As a rule of thumb, your tax is roughly 2% of your purchase price. If the purchase price of the property is $200K the tax is roughly $4K a year. The actual calculation for yearly property tax is the assessed value of the property multiplied by the millage rate minus any homestead exemption. A "Mill Rate" is the amount of tax paid per dollar of the assessed property value. 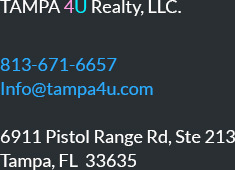 In the Tampa Bay area mill rates vary anywhere from 16 mills to 24 mills. Your tax will be based on the assessed property value after you purchase the property. Homestead exemption is a Florida constitutional benefit of a $50,000 exemption deducted from the assessed value of your property. Anyone who owns real property in the State of Florida and makes it his or her permanent home as of January 1st is eligible for homestead exemption that year. You must file an application with the Property Appraiser. You are entitled to one homestead exemption. If you are married, you will need this information for both husband and wife. Applications may be filed from January 3. The deadline for filing is March 1; the postmark must comply with the legal requirements. If the deadline is missed, you will have to wait until next year and file a new application to receive these tax-saving exemptions. Property taxes are reduced by Florida's exemption laws, which frees a portion of the home's appraised value from any taxation except for special benefits such as voted bond millages, street improvements and the like. Every qualified resident is entitled to Homestead Exemption, freeing $50,000 of appraised value from all taxing bodies. Florida's Constitution and Statutes provide a measure of a tax relief to permanent residents who own their property. Each year between the deadlines, you must apply for the exemptions for which you are eligible. A failure to file on time is a waiver of your right to exemptions for that year. After the first year in which you apply, the Property Appraiser will send out renewal cards. If you do not receive a renewal application, you may pick one up at your local post office or one of the Property Appraiser offices in your county.